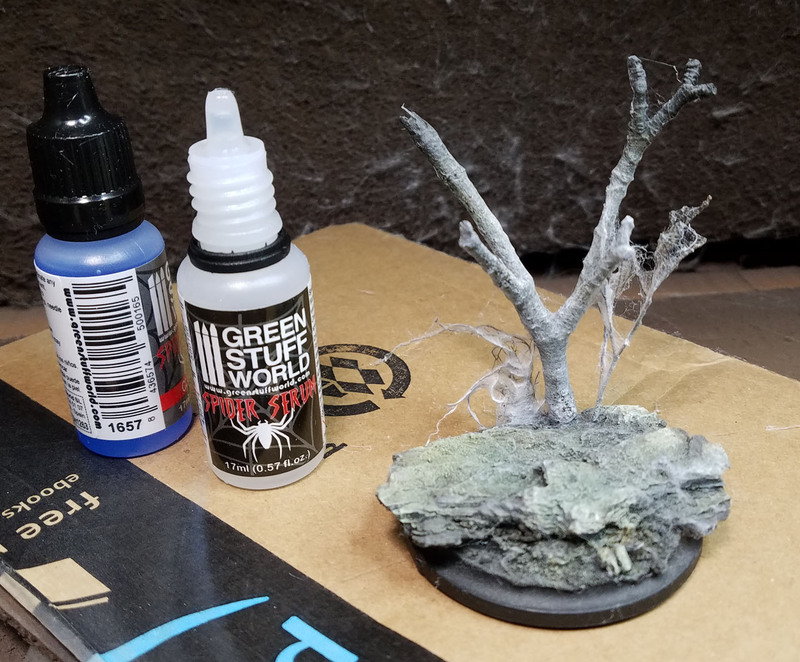 I think has to be one of the most unique things that I have tested out in all the time I have been doing miniature painting, and that says a lot when you consider the massive amounts of new materials I have been trying! 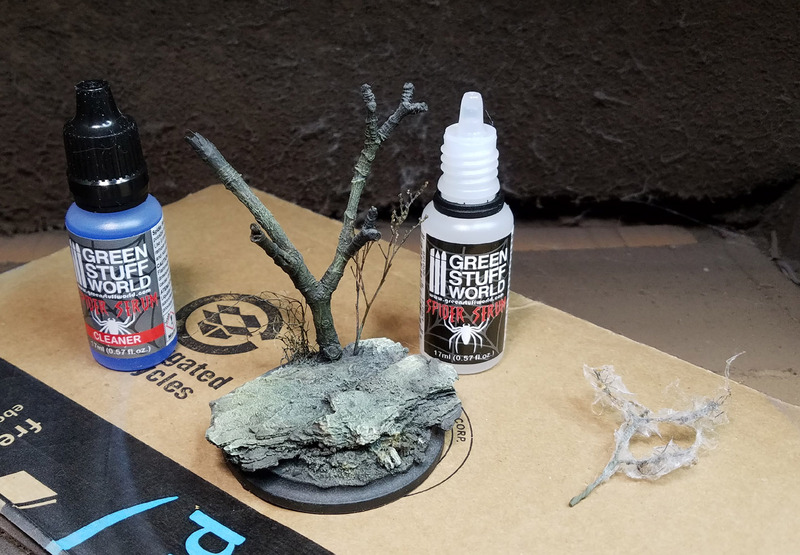 This is a new product from Green Stuff World, and I think you can tell what it is. 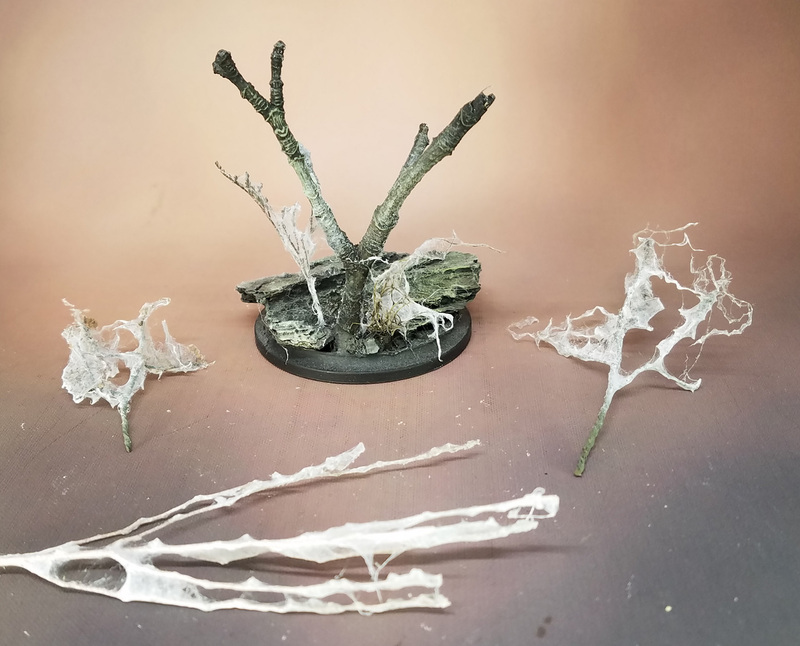 It is a spider web material that is designed to go through an airbrush. There is the web material in one bottle, and a cleaning solution in the blue container. 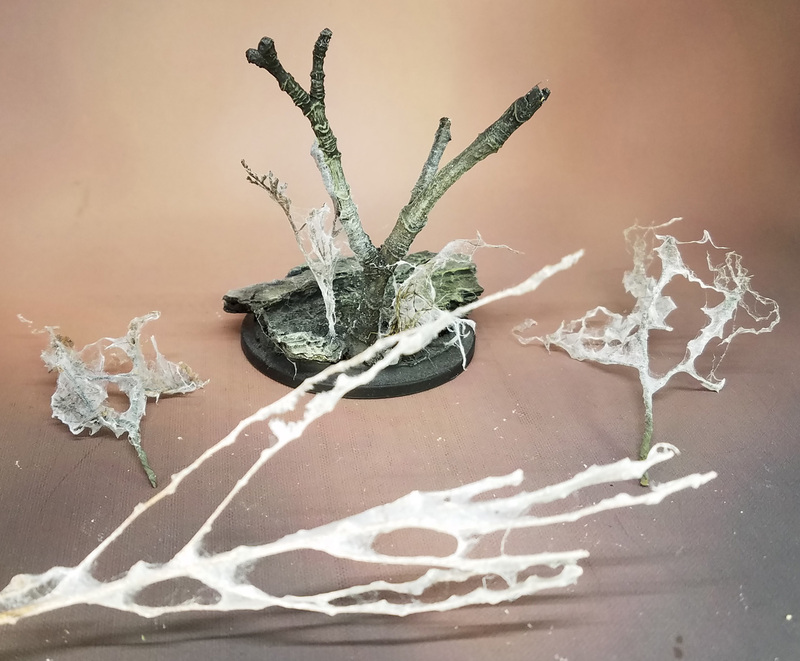 I tried this out on some of my branches, and on a base. There were a few essentials that I noted. 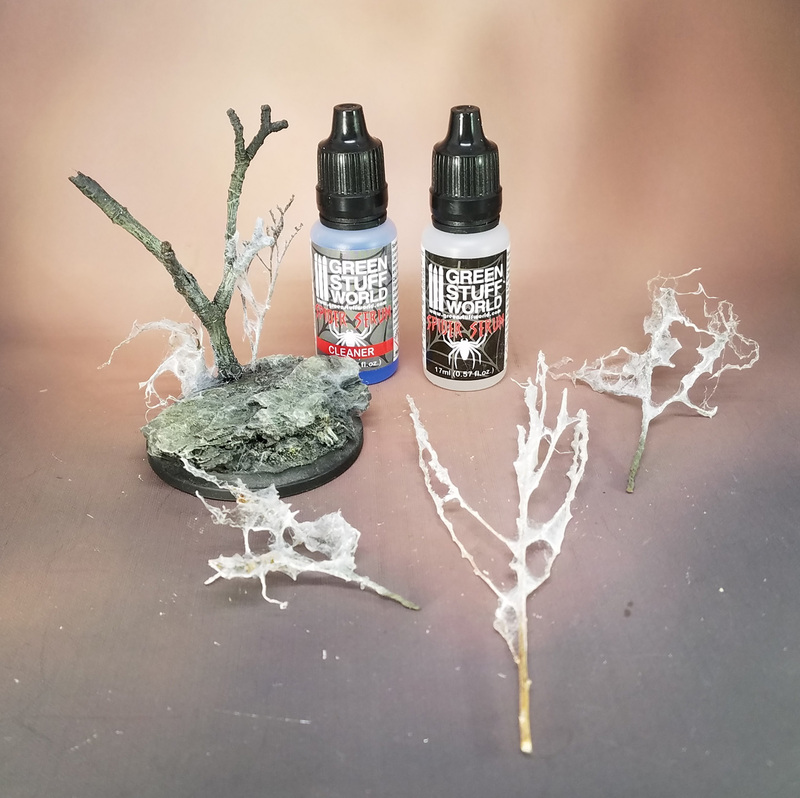 You will definitely want to have a spray booth and a mask. Also, the stray fibers will 'travel' as the wind from the airbrush takes them. The material does not cover large gaps, but does much better when you have bridging material. If I wanted to have the web cross the branches of my base, I would need to have a thread or two... something for it to start on. Once the material is sprayed, you can remove the excess, in this case with a simple brush. You can see how it does better when the gaps are much smaller on the secondary branches. 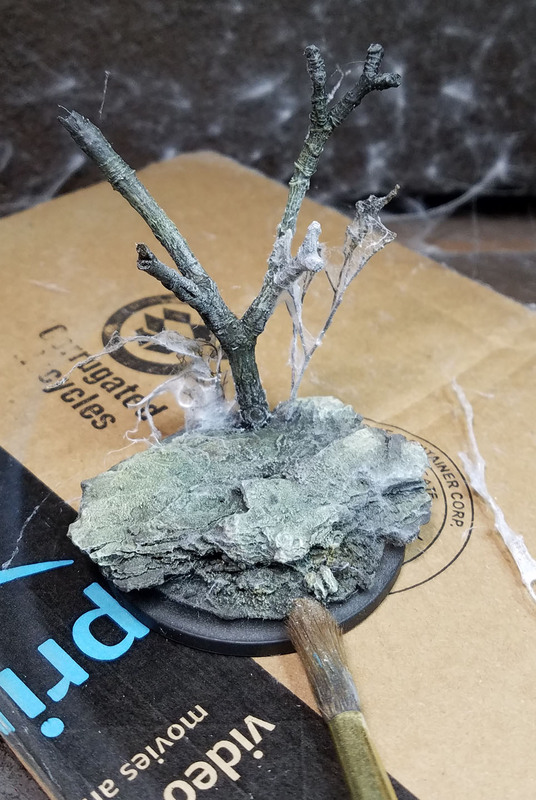 The webs will be pretty fragile, so I don't think you will want to do this on gaming pieces that go in and out of a case. 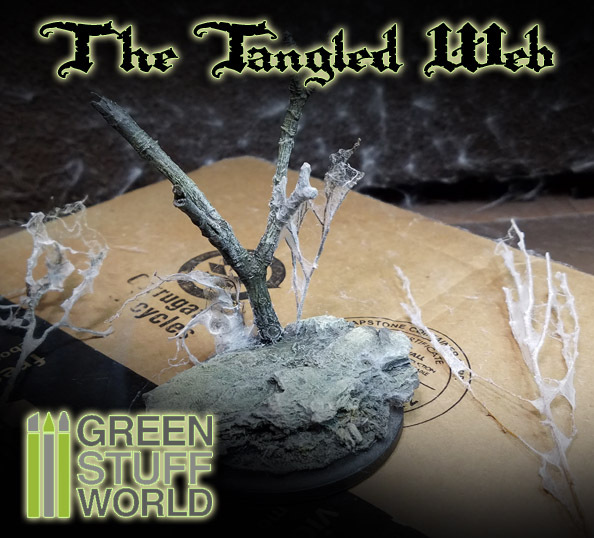 I would also not try to ship any figures where I used this, as the webs would be wiped out. My assumption is that this is for display pieces for the most part. I could probably get away with using it on my armies, as they are all magnetized and sit in my boxes. I would want them far away from any parts of the figure or base where I would handle them. 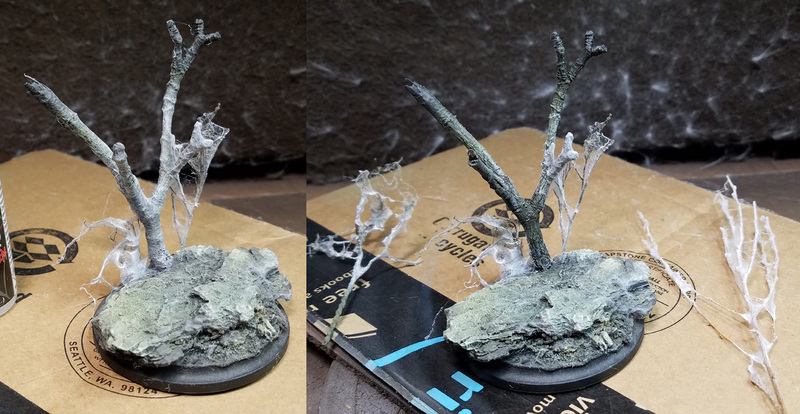 Obviously I will test this some more, seeing how it might work on architecture or undead figures. I'm sure that I will discover more methods for using it. In these tests, I was using a Badger Sotar brush. As the instructions stated, I ran the cleaner through right away after using it. A few minutes later I was doing some regular painting with the brush, and that did not seem to have any effect on that. Stay tuned!